Covert camera system that features everything you need to utilize a high performance covert camera system with four cameras at once. 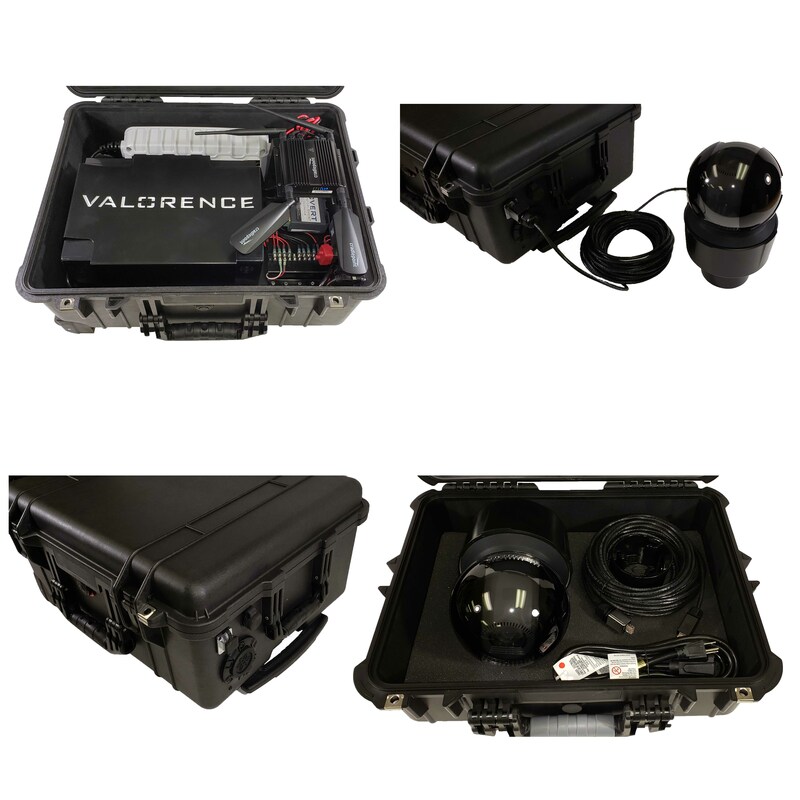 When the investigation calls for a battery powered, versatile, powerful, long distance surveillance system the "All In One" will fit perfectly. 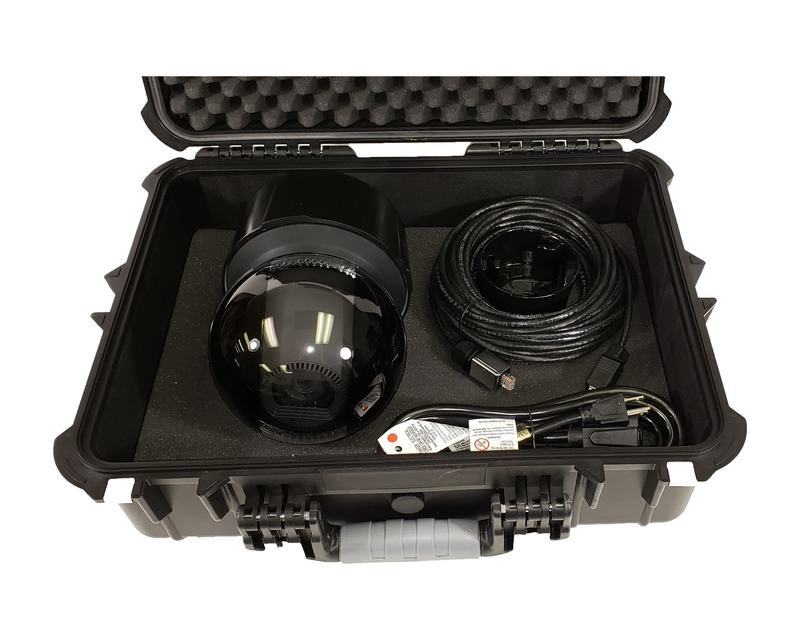 The "All In One" system fits the necessary components, inside a highly portable case, to power and remotely monitor this long distance surveillance equipment. Powered by a 100 Ah (3 days charge) LFP 12v battery, that is charged by simply plugging into an outlet. 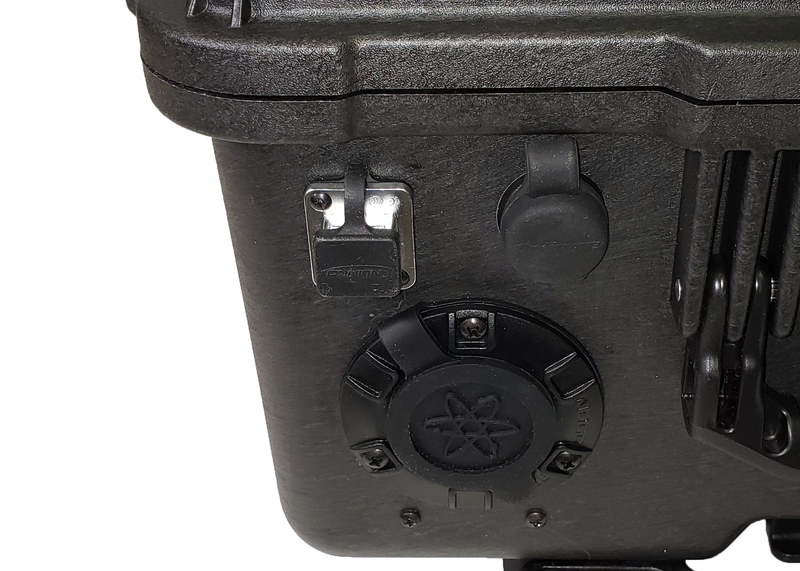 The enclosure broadcasts its own secure close range WiFi signal , as well as integrated cellular network with included: AT&T and Verizon cellular coverage. Equipped with an Axis PTZ camera with up to 30x optical zoom, and night-vision capability. 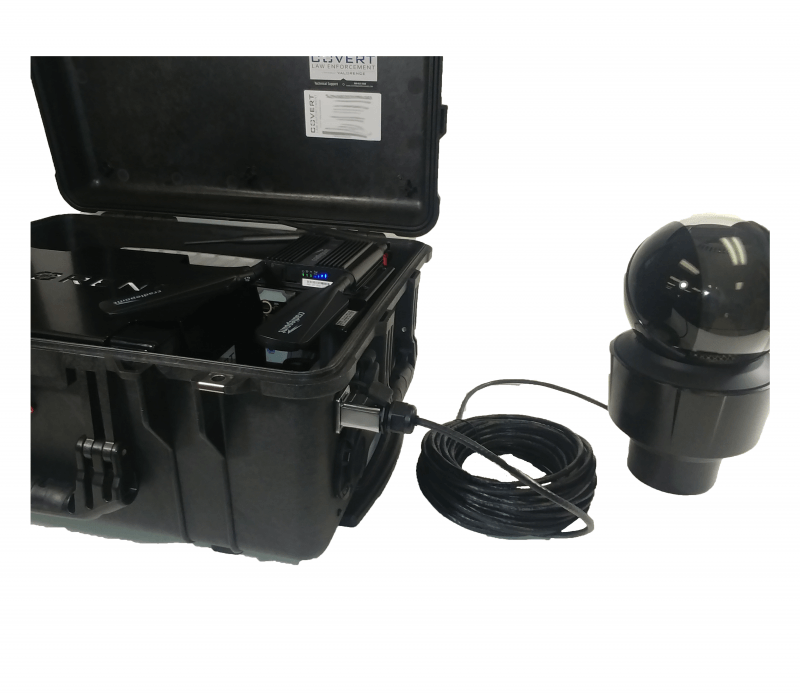 "All In One" can be used indoor, and outdoor with little worry of the system being damaged or compromised; in part to the rugged, weatherproof Pelican case enclosure. The case is easily portable, fully loaded, weighing 60 pounds. With a side, front handle and extendable back handle with wheels for convenient transport. There are two, metal cased, padlock slots on the latch of the case for extra security, with the option to have a cable or chain to secure the case itself to wherever it will be mounted. 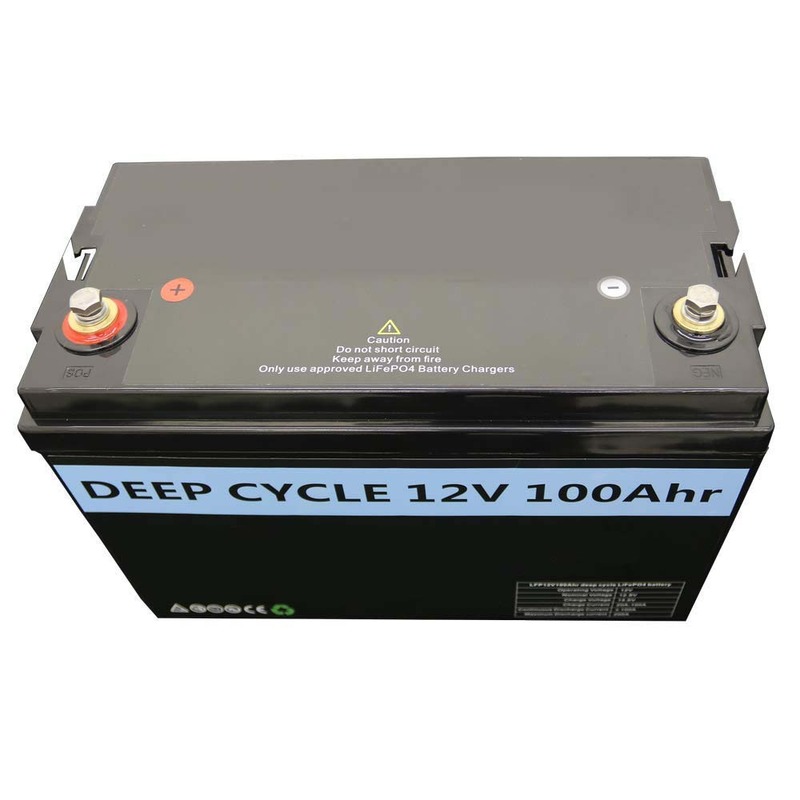 Powered using a lightweight, 100 Ah LiFePo 12v Battery, charged by the internal battery charger, with a recharge time of approximately 4 hours. The advantages of using a LiFePo battery are the lightweight, fast charging time and much longer life of approximately 10 years. The battery is protected with standard reverse polarity and from over voltage spikes while being charged. The camera is connected via 25 foot, or 50 foot weatherproof Ethernet cable that allows for the camera to be deployed a safe distance from the case. Axis Q6125 PTZ camera gives full 1080p resolution with 30x optical zoom. Built-in IR and Optimized IR for full night vision capability. Local memory capability, Micro SD card. Included for mounting the camera, are a high powered magnetic mounting bracket and a blank bracket with additional versatility. The system uses a Cradlepoint router for remote viewing, that accessible with its own WiFi signal, integrated 4G LTE (Verizon & AT&T) cellular network. FirstNet compatible and works with all major carriers. The router is capable of SMS text restarts and status for convenient use, it is also equipped with a keyfob remote switch to allow for system restarts.